COMMUNITY program was initiated in 2013 to provide opportunities for members to reach out and directly give back to the local communities that we live and work. 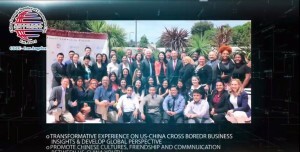 The program aims to provide opportunities for Chinese enterprises to establish good community relations and fulfill the social responsibilities while conduct business in the U.S. During the past five years, we partnered with US leading organizations in the region, such as Meals on Wheels, Foodbanks, Boys and Girls Clubs, and the efforts were well-received and recognized by the communities. The 5th Annual Community Program in 2017: Discover China expedition supported 22 exemplary youth leaders selected from 140,000 teenagers in the Greater Los Angeles area, who visited Xiamen, Shenzhen and Shanghai, and more than 10 leading Chinese and American enterprises, not only demonstrated but take the commitment to engaging with the local community to the new level, which created opportunities for American youth leaders to gain an understanding of China and Chinese enterprises. It was well-received by the local government as well as leading Chinese and U.S. media outlets. We would like to take this opportunity again to express deep gratitude and look forward to continuing to work together with you to make the positive impact contributing to enhance U.S.-China relations! CGCC-Los Angeles wishes you a Happy Holiday!